This morning I arrived in London. I left for a trip all by myself which is something I had never done before. (Well, assuming that moving alone to a whole another country doesn't count.) I love this city so much and then again, why wouldn't I - London is basically the Mecca of modern-day pop music. I find it so amusing to just walk about, spotting things and names previously familiar from various songs and movies. And whenever I'm in London, one particular album hits heavy rotation in my brain. That album, as you might guess by the picture above, is What's The Time Mr Wolf? by Noisettes. Past few years haven't been too favourable for rock music, and the charts and the mainstream consciousness have been dominated by electronic-influenced dance-pop music. It was all different in the mid- to late-2000s - there were new rock bands (and especially, so-called indie rock bands) popping up like mushrooms to the extent that music journalists started to describe a lot of new guitar-oriented indie music as 'landfill indie'. Indeed, considering that there were so many new similar bands being founded all around the world (and especially in the UK), many of them had a hard time trying to differentiate themselves from the others. Magazines and websites such as NME were filled with bands that far too often sounded far too similar. Fortunately, there were exceptions out there too, and (along with Band of Skulls) one of my favourite bands to emerge from the mid-2000s indie rock scene was Noisettes. The band was actually founded already in 2003, but it wasn't until 2007 that they released their debut album What's The Time Mr Wolf?. 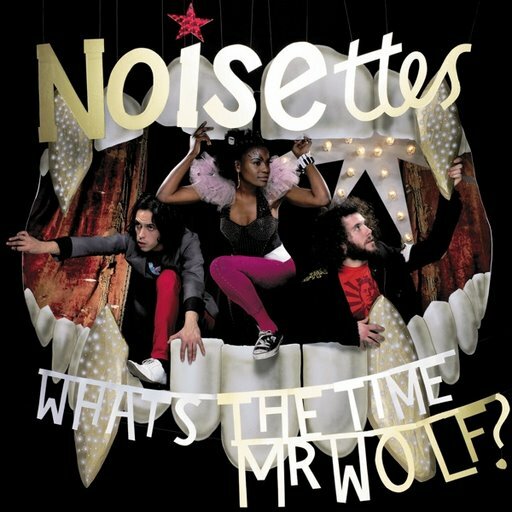 Although before that, they did record two EPs (Three Moods of the Noisettes, What's The Time Mini-Wolf? ), and most of the tracks included on the EPs made their way to the debut album. They were initially sometimes compared to another indie rock band Yeah Yeah Yeahs, and seen as the NY-based group's London counterpart. The comparison is not that far-fetched: both were three-piece bands fronted by a quirky, edgy female singers. The record shows that they are capable of so much more than just writing amped-up rock n' roll tunes. Take "Scratch Your Name": it's a great mid-tempo track that urges the listeners to be brave and make a difference with doing something significant with their lives: "Scratch your name into the fabric / of this world before you go". Both "Bridge To Canada" and "IWE" are equally catchy tunes that show the trio at their rawest and edgiest. Then there's "Cannot Even (Break Free)" which interestingly alters between soft and waltz-like and on the other hand, loud and harsh. "Mind The Gap" is the experimental masterpiece here, being a highly progressive and deliciously unpredictable piece that goes through riffs and time signatures like Taylor Swift goes through men. It's a powerful tune that tackles racism, discrimination and the feeling of indifference among people by using terminology inspired by public transport: "Please give up this place to someone worthy / Of course we are not worthy / to rest our bones". The album closer "Hierarchy" features a stirring build-up and is a melancholic and dramatic song that might criticise assertive authorities or perhaps organised religion, kind of depending on how you interpret it's cryptic lyrics. Anyway, it ends the album on an incredible note. Spoilers though: if you've got the patience, you'll discover that there is actually a lovely hidden track in the end of "Hierarchy", called "Never Fall In Love Again" that has Shoniwa and Smith harmonising again, this time accompanied with an acoustic guitar. What's The Time Mr Wolf? is nothing short of a phenomenal debut album. Honing those skills for years clearly paid off, and the band that plays on the album sounds confident with their own, original sound. Also, the album is pleasantly diverse, from the rock n' roll atmosphere of the faster tracks to the more left field numbers that see them exploring with their skills and ideas. Thematically, travelling seems to be a recurring theme. "You're on the bus again / past Big Ben / With your rip off Oyster Card" sings Shoniwa in "Sister Rosetta (Capture The Spirit). Lost passports are mentioned in "Bridge To Canada", whereas the person who the song "Cannot Even (Break Free)" is sung to wishes to break free and escape on a magic carpet, being "ever so transported from here". "Mind The Gap" and its lyrical analogies probably speak for themselves. And when travelling in London, what would make a better soundtrack for the trip than an album actually describing the life and travelling in London? Fear not, though: you don't really need to travel here to enjoy the record. I'm sure it should be more than enough to impress you of its own accord. It's too bad that after such an exceptional raw debut, the trio opted for a more polished and radio-friendly sound - the bonus track "Speedhorn" alone blows most of their latter material out of the water. Try at least: "The Count of Monte Christo", "Sister Rosetta (Capture The Spirit)", "Speedhorn"